Soured Chickpea Curry is an oil-free and vegan high protein curry made from just a few natural ingredients. 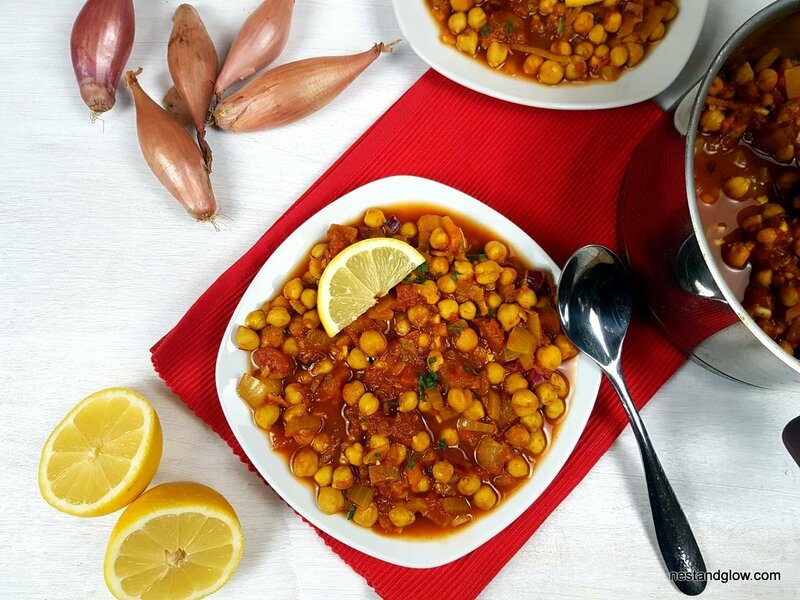 Easy and quick curry that’s full of spices and blends lemon with sweet tomato and creamy chickpeas to make a delicious healthy curry. This is a great recipe that I have during the winter months as this healthy curry contains many spices. The cayenne pepper, ginger, chilli and turmeric feel like they are giving my body just what it want’s during cold weather. 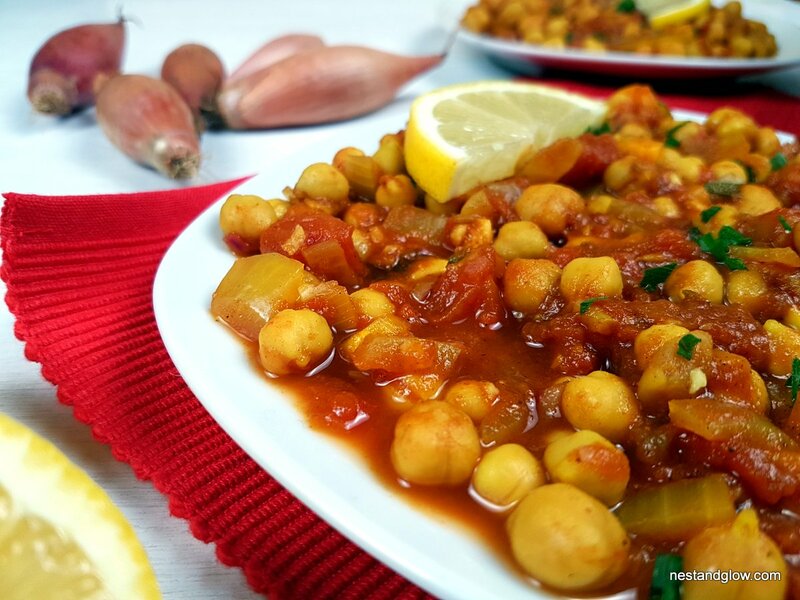 Although the name of this healthy curry recipe is soured chickpeas they aren’t actually sour as the natural sweetness of the tomatoes and onion balances it out. The lemon juice gives the sour flavour and the sweetness from the tomatoes, the spiciness from the chilli and the saltiness all together give a great balance of flavour. This curry is based on an Indian street dish that I often had a restaurant versions of while travelling in India. The dish is finished with raw lemon juice, onion, garlic and chill to give a mixture of flavours and textures. If you are not a fan of chunks of ginger in a curry you may want to finely grate the ginger. I don’t cook this healthy curry dish with oil for health reasons as even the good quality cold pressed oils lose many of their nutrients when heated. Instead, I just add a bit of water to “water fry”. If all the water evaporates and it’s still not cooked then just add some more water, cover and stir every min until cooked. to make the onions caramelise without oil just let all the water evaporate and cook for 1-2 mins on a medium heat. Even if the onions stick to the pan once you add the tomatoes and chickpeas they will loosen along with their caramel, just don’t let them burn. Use whatever chilli pepper you like. I usually use a small green birds eye chilli and don’t deseed it. For the video, my veg box delivered mild larger orange chilli peppers so I used them. Deseed the chilli and remove all the white membrane to give a mild spice. I usually double the amount of cayenne pepper and turmeric that is listed above as they both have health benefits and the turmeric gives a golden colour. For a more decadent curry try serving this chickpea curry with a dollop of coconut cream. The creamy coconut gives this vegan curry dish a different flavour as its far richer and creamier. I think of this chickpea curry as a different way to get all of the health benefits from ginger, turmeric and lemon. Fry the onions and 4 cloves of garlic for 4-5 mins until softened. I “fry” in a few tbsp of water for health reasons but use oil if you prefer. Add the tomatoes, chickpeas and ground spices and simmer for 10 mins with the lid on, stirring occasionally. Juice the lemons and mix with the diced ginger, a diced clove of garlic and the chilli finely ground. Let it mingle for 5 mins while the curry cooks. Stir in the sour lemon mixture and serve the curry with shredded coriander. Wow, so easy and so yummy. I just changed my diet to dairy, gluten and refined sugar free and your recipes are helping me quite a bit to plan my meals.